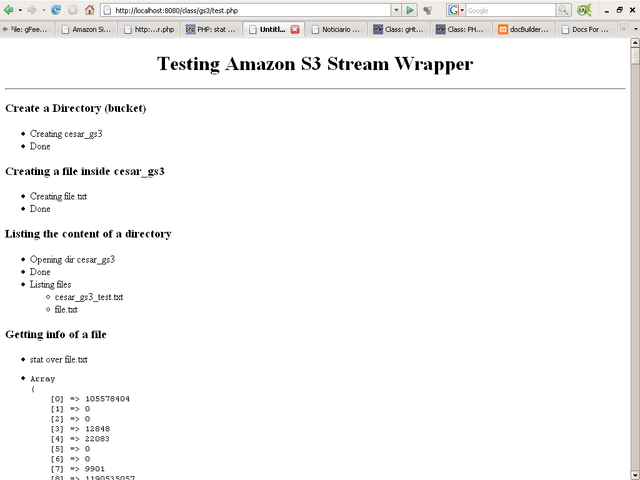 This class is a stream wrapper that can be used to get and send files to Amazon S3 (Simple Storage Service). It sends HTTP requests to access Amazon S3 Web services API in order to store and retrieve files just by using fopen('s3://...') calls and using regular fwrite and fread functions to send and retrieve file contents from Amazon S3 servers. This stream wrapper class can also delete files, create, list and delete directories. Number 7 Amazon S3 is a popular service for storing files. Files stored in Amazon S3 can be made available via the Web at a low cost for the storage space and bandwidth that it is used. Clients of the service must use special software that sends HTTP requests to store and retrieve files from Amazon S3 servers. This class implements a PHP stream wrapper that makes it easy to store and retrieve files stored in Amazon S3. With this stream wrapper, PHP applications only need to use regular fopen, fread, fwrite and fclose PHP functions to send or receive files from Amazon S3. Is it possible to attach a file hosted on Amazon S3 in your outgoing email in PHP or Python? Hello to every one, you may be surprised by the title of this post and you may be wondering why a remote file-system in PHP?..